This election is timetabled for early in the new year. It was pointed out that for some years the trade unions have been pressing for a procedure which is more representative of the two wings of our party, the industrial and the political. In particular, an electoral college consisting of 50% young party members voting by OMOV, and 50%, affiliates – using their own mechanisms to reflect the views of their young members. After lengthy discussion, this procedure was agreed for the 2018 scheduled election. It was noted that this matter is covered by the Democracy Review and thus, in due course, the new arrangements could be amended. Jeremy warmly welcomed everyone. He then reflected on the sad events in our party in the last few weeks. Jeremy was immediately in touch with the families on behalf of the party. Jeremy recognised the shock and distress suffered by our staff in Wales and at Head Office, and expressed his admiration for the professional and heartfelt way the staff had responded. Jeremy then gave warm congratulations to Richard on his victory and to all our members and staff in Scotland on the comradely way the election was conducted (by coincidence, Richard was sitting directly underneath a bust of Keir Hardie, the first leader of the Scottish Labour Party and the UK party). Jeremy added that he has and will visit Scotland at least once a month. As everyone in the room acknowledged, Labour must regain its historic successful record in Scotland. Jeremy then took the meeting through the major issues over the last two months. He highlighted the importance of the Democracy Review. Jeremy emphasised that the party must be inclusive and new members must feel welcome. He encouraged all constituencies, branches and members and all affiliates and other interested parties to make brief recommendations or more detailed submissions to the review. They will all be examined in detail by the diligent team headed-up by Katy Clarke. Jeremy then moved on to all of the issues raised in the discussions around the Budget. Labour is clear that we have a strong anti-austerity programme, that will be investment-led and will generate growth and jobs. It will also of course involve the public ownership of the utilities, who have for years been enriching the fat-cats at the expense of the general public. This unjust situation must be brought to an end and Labour will guarantee that it is. Jeremy also highlighted the scandal of the homeless on almost every high street. After the transformation brought about by Labour’s 1945-51 government, there were no homeless. There was a major supply of council housing and our voters had decent jobs and wages, not zero-hours exploitation. Jeremy pointed out that John McDonnell would be covering all of these issues later in the meeting, and did not want to steal his thunder. Jeremy therefore moved on to outlining the work that the Frontbench and PLP in general are doing to bring some sense to the chaotic Brexit negotiations. He drew attention to Ian Murray MP’s motion, which was somewhat unhelpful. Ian had agreed that he would move his motion but would not push it to a vote. So it was agreed to only have a one-line Whip. But unfortunately Ian’s motion was voted on. Jeremy then moved on to an account of human rights abuses around the world. He drew attention to the huge number of refugees from Myanmar fleeing to Bangladesh. Jeremy has made several strong protests about the unacceptable behaviour of the Myanmar army. Our new MP for Tooting Dr Rosena Allin-Khan has been in the region providing personal medical assistance to those in need. Jeremy deplored the way Yemen and its people are being treated by outside forces. In particular he highlighted the Saudi-led bombardment. We have an absurd and shameful situation where the UK gives aid to Yemen and sells arms and bombs to the Saudis. Jeremy highlighted the treats to human rights in particular in Turkey and Zimbabwe. We must all hope the recent events in Zimbabwe will lead to the restoration of and respect for human rights. The Frontbench has been doing all they can to press Iran to release Nazanin Zaghari-Ratcliffe. Although the contribution by the UK’s Foreign Secretary has been overwhelmingly negative. 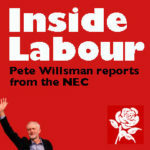 Jeremy also gave an account of the major rallies and conferences which he has attended, drawing attention to the fantastic effort made on the party’s National Campaign Day, which had been held the previous day. There had been over 600 events around the UK. Jeremy highlighted that our rallies are increasingly inter-generational, all generations are coming together in a demand to build a better society, after the immoral destruction by the Tories. Jeremy assured us that he intends for the next Labour government to bring about changes of historic significance comparable to the 1945-51 Labour government. Richard gave a rousing call to all our Scottish members and voters. He exuded enthusiasm and energy – I began to feel sorry for Nicola. The bubble has burst and the SNP are on the way down. Richard is clearly going to accelerate their decline. Richard stressed that Scotland is politically, electorally, and symbolically critical to our party and our Movement. Scotland will be key to electing the next Labour government. Jeremy has transformed the mood in the party and among the voters. Richard emphasised that his election victory provides the opportunity to attract SNP, Greens, and non-voters to our anti-austerity and progressive policies. It is already clear that the SNP, despite their fine words, will effectively have an austerity budget. They will make yet further reductions in funding for local authorities. We must expose the fact that the SNP are effectively a conveyer-belt for the Tories’ austerity agenda. We will use our influence in local government as the focus for our fightback. Our message will be a positive one which makes clear who we are, what we stand for, and who we represent. Richard ended by highlighting that our party, led by Jeremy, offers real change. At all times the Scottish party will work on behalf of the many, not the few. Brian Roy, secretary of the Scottish Labour Party, complemented Richard’s report. Brian stressed that all full-time and part-time staff, together with all our members, are raring to go. They are totally committed to regaining Labour’s hegemony in Keir Hardie’s homeland. There was then a very enthusiastic discussion about our policies and campaign in Scotland, which will complement a similarly effective campaign in England and Wales. The SNP will permanently be on the back foot. This was followed by lunch provided by Unite and lots of mingling between the two Executives. After lunch, the NEC returned to its normal business. It was a good session but lacked the verve of the joint meeting. Iain outlined the comprehensive staffing and organisational structures being put into place for a possible early general election. I emphasised that all of our policy documents, produced by the NPF, must take our 2017 manifesto as the basis for future policy. Iain confirmed that this would, of course, be the case. Membership is set to end the year at 568,500 – up 25,000 on the 2016 figure and the highest figure since the party kept accurate records. So far this year our 107,000 new members means that we have recruited over 500,000 over the last 3 years. Obviously, as always, there has been some loss of membership, for all sorts of reasons. Increasingly those that fail to renew are contacted, in some cases several times. This has had the positive result that some 43% of those falling into arrears respond to our calls to renew. In addition there are many local initiatives that also have a significant effect. Contrary to the hostile press and media, our party is not southern dominated. The largest increases in membership were in the north and Scotland. In Scotland in the last year there has been a stunning 22.5% increase in membership, followed by the Northern region with an 8.8% increase, and then the North West with an 8% increase. Recent years have also seen a very positive trend of younger members joining. This has had an impact on the overall make-up of our membership, with the average age having fallen from 55 in 2014 to 46.5 now. I pointed out to the NEC that whereas the Campaign for Labour Party Democracy is a force to be reckoned with, our mirror organisation, the Campaign for Conservative Democracy, is struggling to exist. But recently their Secretary revealed to Tribune that the average age in the Tory Party is around 68 and their membership is well below 100,000 but kept hidden from the public. At this point, George Howarth MP called out that their youth section is no doubt 59 and under. Finally, it was reported that until 2015 the gender split within our party had been around 60-40. In the last 3 years this gap has considerably narrowed. The Review team is consulting widely with the SEC, WEC, CLPs, affiliated trade unions, other affiliated organisations, the PLP, and individual members. A first report will be timetabled at the 2018 Annual Conference in Liverpool. Katy outlined the key points of the work already undertaken, and informed the NEC that a range of specific events are being organised to maximise the input from our women members, disabled members, young members, BAME members, and LGBT members. During the discussion I made two specific points. Firstly, that much greater efforts must be made to make the selection for public office more of a level playing field. The current situation favours the economically advantaged, who can take time off and spend thousands on specially printed literature. There is a built-in bias against the working class. There are bursaries being developed to address this issue but much more needs to be done. Secondly, I argued that the Review should cover the weaknesses of our disciplinary procedure. It is a democracy issue that members can be suspended for well over 2 years and CLPs can be in special measures for some 25 years. It is also the case that the National Constitutional Committee needs to be much enlarged. There are only 11 of them and 3 must make up a panel. Not surprisingly they have a large backlog of cases. A very authoritative and upbeat presentation was made by Andrew Gwynne MP and Ian Lavery MP, our party’s National Campaign Coordinators, complemented by our new and enthusiastic Executive Director, Anna Hutchinson. Andrew took the NEC through the boundary changes that will affect 4 metropolitan districts, 3 London boroughs, and 7 county councils. Andrew also outlined the gains and loses in the 2014 election. In that election there were 159 UKIP gains – 80 from the Tories, 52 from Labour, and 24 from Liberals. Evidence suggests that there is a tendency for ex-UKIP voters to vote Tory rather than Labour. Iain concluded this item by running through all of the seats where we are having early selections. This item was introduced by Cath Speight (JPC co-convenor), complemented by the Executive Director, Andrew Fisher. Attention was drawn to the fact that there has been an increased emphasis on party democracy over recent years. For example, a composite on housing was carried at this year’s Annual Conference, and then in his closing Leader’s Speech, Jeremy referred to the Conference decision as ‘party policy’. The NEC has been pressing for a full National Policy Forum get together to begin developing our progressive policies. Iain responded by confirming that a full NPF is being arranged for either late February or early March. Seumas Milne (Executive Director) introduced this item. Seumas enthusiastically went through all of the political weaknesses of the Tory party, both in parliament and on the ground. Its membership is dwindling and they are paying delivering agencies to put their literature through letterboxes. Seumas was pleased to point out that Jeremy is becoming increasingly popular in Scotland. His monthly visits showcasing our popular policies are clearly having an impact. Seumas emphasised the shift in the political climate that is now becoming clear, even to the hostile press and media. Richard Corbett (the new EPLP leader), after commenting that at the NEC Glenis had left very large shoes to fill, drew attention to the changing landscape in relation to the Brexit issue. He drew attention to the mess the Tories are making of the Brexit negotiations. Richard emphasised that we need to take maximum advantage of the situation. During the subsequent well-informed discussion, I made the point that the argument that gets across on the doorstep is to make a comparison between the 1950s after the 1945-51 Labour government and the present disgraceful situation. When I was young, there were no homeless sleeping in doorways, no betting shops, no pawn shops, no zero-hour contracts. There was a genuine welfare system. People had proper jobs, proper apprenticeships, and access to excellent council accommodation. By contrast, when the Tories are in government, homelessness, poverty, and inequality massively increase. The public are increasingly seeing Jeremy and what he stands for as a refreshing and genuine alternative. The Tory lackeys in the hostile press and media, have attacked Jeremy for so long that the public have become immune from their lies and distortions attacks. John McDonnell led a lively discussion on the lacklustre Tory budget, which met none of their hollow promises. John emphasised that we are winning the argument on fair taxation, on tax evasion, tax avoidance, on austerity, on housing, and on poverty and inequality. John stressed that our policies will always be properly costed. He highlighted the failure of the Budget to address social care. A majority of NEC members contributed to the very worthwhile discussion. Attention was particularly drawn to the continued total hostility of the Tories to council housing. I pointed out that there are some stellar failures to highlight. For example, that we are now back to 1905 in terms of the inequality between the rich and the poor. We now have the longest period of stagnant real wages for well over a hundred years. Recent statistics can be used to highlight this dreadful situation. In 1998, the average pay of a FTSE 100 boss was 47 times higher than the average worker. It is now a staggering 160 times higher than the average worker. I also pointed out that the Tory deceit of comparing a person’s debt with a country’s debt. An individual is unable to print billions of new money – which the central banks are doing all the time. In detailed response to the debate, John stressed that the lacklustre Budget had addressed none of the major issues we had highlighted. There are surely dangers with harking back too strongly to the 1945-51 Labour government and its impact in forging the Butskellite consensus (with a measure of rose-tinted nostalgia to boot). Capitalist enterprises were in a far weaker position then, with the success of WW2 state intervention and with private enterprise in a parlous state. Firms were much smaller and there was far less globalisation. There is a wealth of scholarly research on all these trends. It might also be added that it was because the Labour Party in the late 1940s and early 50s went for a strategy of “Consolidation” rather than “Advance” that 1945-79 social democracy with its internal contradiction – combining a MILD measure of social justice with overwhelming private ownership of the economy – led the country ultimately to neoliberalism. All of this should draw us to the conclusion that there is every likelihood of attempts to blow the Corbyn government off course by today’s far more powerful capitalist forces and their supranational organisations, as happened with Labour in the late 1970s and Syriza in Greece. The strategy to resist such bids to make the next Labour government return to the neoliberal path of Blair/Brown should preoccupy blog sites such as this one. Jon thought the show had gone well. After every one had gone home Jon came out from behind the curtains and put Jeremy away in his box. Jon took extra care with Jeremy’s strings. Jon thought to himself, of all the puppets he has ever had Jeremy is his favourite. Lansman has got to go. Kinnock saw the danger Lansman posed to the British Labour Party back in the 80s. He fought it and beat it in 88. Corbyn on the other hand, is where he is because of Lansman. This is the time for an organised schism. Labour MPs and there are many, know what is happening to the body of The Party. They have tried to get rid of Corbyn and failed. There is only one honest course of action for them now to take. Leave. Start again. Brexit plays into this time line perfectly. MPs from other parties may even consider joining them. That in itself demands consideration; the total realignment of British politics. A Tory government contolled by a few ideological Brexit puritans and a Labour Party controlled by the parasitical movement that is Momentum leaves the middle ground of British politics wide as the Clyde. Of course this is never going to happen for the obvious reason; the selfish career survival instinct. So as I say, easier said than done. The tiresomely predictable and endlessly ignorant poster known as “Richard MacKinnon” just surely has to be an automated political posting bot. Is there any predictable cliché it won’t spew out ? The current neoliberal consensus meme just expressed – for a neoliberal pro EU political cross party realignment of the Centre Right into a “Macronist” new “Centre Party”, is so predictable as to suggest my suspicion is correct. Thanks for the report Peter, informative as ever it and much appreciated. Excellent report Peter, thanks for this. Previously on here, we’ve debated and discussed the issues around continuing single market (SM) and customs union (CU) membership after we depart the EU. I’ve taken the view that we should quit both SM and CU when we leave the EU. But the impact on Northern Ireland has gradually led me in the direction of support for Labour’s position of continuing SM and CU membership for a transitionary period after we leave the EU. Looking at the Northern Ireland ‘conundrum’, I think I’m coming round to the view that this is the only way to preserve the peace. I’d be interested to know what others think? And what other solutions people think there are to this question other then staying within the SM and CU for a transitional period? Nothing wrong at all with a transitional period of some considerable length, but to implement any sort of radical transformative economic agenda on a long term basis the UK , under a Left government of course , not the Fox/Johnson type neoliberal crazies, needs to leave the EU, the CU, and the Single Market within, say, five years. Northern Ireland and the EU is indeed a real conundrum. Fortunately for us, at present that conundrum holds out the distinct possibility of bringing down the current Tory government ! So hurray for that conundrum ! Another advantage of a long transitional period is that it would both avoid the “cliff edge” of over-rapid transition, AND expose the structurally inbuilt neoliberalism of the EU and its Single market rules , actually in operation, opposing quite modest reforming Labour government economic measures. Thus giving the lie to that pro EU Left argument that “everything a Corbyn government wants to do can be done WITHIN the EU/Single Market”. Is it worth re-hashing all these arguments again though , for the zillionth time, here ? As this is essentially a zombie discussion forum – kept ever so slightly “active” (but not alive) purely to justify Jon’s place on the Momentum dodgily composed “leadership body”. I think it is just about worth saying again that JohnP is entirely wrong in what he advocates, which a predominantly Remain party would never support. The long transition puts off the the reality of leaving and is designed to keep Remainersa on board, as respecting the result is designed to keep Leavers on board. Despite this, if the government fell, Labour , if it won, ( and if it didn’t the hard brexit crazies have won) should call a second referendum which if it reversed the previous decision, which it almost certainly would, would enable the withdrawal of Article 51 and for the UK to remain in the EU. A Labour government should then promote the reform of the EU that would enable greater control by member states of their own internal affairs, particularly regarding public ownership. Pure fantasy and unsupported conjecture, , Peter, yet again. And what if this second Referendum DIDN’T vote to stay , Peter ? You, on no evidence at all, other than reading the Guardian’s middle class fantasy coverageof Brexit too much, think this is a certainty, but it simply isn’t. Secondly the neoliberal to its roots EU is completely unreformable. Your baseless belief that it is, is pure Left Fabianism. And your belief, along with the Guardian opinionators, that Article 50 could simply be withdrawn, and the UK could go back to the pre Referendum status quo is also very iffy indeed . MUCH more likely that a supplicant UK on its begging knees to stay in would lose its annual contributions discount AND have to enter the Eurozone, as a victorious EU punishes the UK as a warning to others that , like the Hotel California, “you can check in anytime – but you can never leave”. You don’t think the EU would be so nasty, Peter ? Just have a look at the Troika’s ruthless ransacking of Greece, and try and substantiate your ludicrous fantasy that the EU is the redoubt of all things civilized, and the foundation of a future United Workers State of Europe. My views have nothing to do with the Guardian or the Fabianns, neither of whom advocate reform of the EU, which is perfectly possible – I hope John has read ‘Bringing democratic choice to Europe’s economic governance’, Rosa Luxembourg Stifftung March 2017. I would welcome his comments on it.I will not otherwise rehearse the arguments as to why mine is the only credible left strategy and a left brexit a fantasy, as I have done this a number of times already. Why do pro-EU fanatics constantly insist on calling for a “second” EU referendum? We had a second referendum last year. The first referendum was way back in 1975 – 41 years before. A further EU membership referendum would be our third. Going by the precedent set, if a third referendum is to happen, it’ll be due in 2057. There is absolutely no justification whatsoever for another EU membership referendum to be held before then. Peter can you throw any light on the claim that the NEC sanctioned the giving of the Del Singh award to JLM ?